When I was a child, everyone was crazy about chocolate cake. It seemed to be the star of every birthday party, along with the balloons, presents and pin-the-tail-on-the-donkey. Myself, I’ve never been extremely partial to chocolate. I can enjoy it, to be sure, but I don’t crave it. And, it certainly isn’t at the top of my “yummy” list, whether we are talking about cakes, cookies, candy or ice cream. I was pretty boring as a kid, preferring oatmeal cookies, white chocolate candy and plain vanilla ice cream. Then, something happened that set up my cake preference for life…I tried my first slice of spice cake. I honestly have no idea where or when this happened. But I do know that once I tasted it, I never had another cake preference again. Wedding cake? Must be spice cake. Birthday cake? Yup, spice cake. Baby shower? Sign me up for some spice cake! Other people have harangued me for my choice numerous times. Apparently there are large numbers of people who dislike or even (shudder) hate spice cake. Those people are boring whiners who need to take there Devil’s Food cake and shove off! LOL. But, my one fault has always been that I have never baked a spice cake myself that did not come out of a box marked Betty Crocker or Duncan Hines. Truly. Never. Not once. Until just this year. I wanted to make something special for my hubby’s birthday in May. And those of you who read this blog will know that we are healthy food people, or at least natural food people. So, how could I turn to a box. Well, I couldn’t do that. So, I did my research, practiced a little trial-and-error and ended up with the most moist, lovely, homemade spice cake. 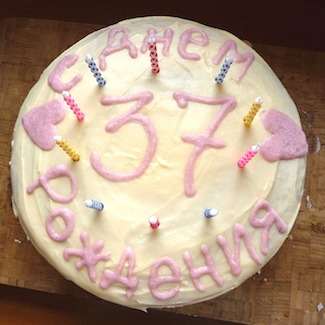 It was a big hit (with “Happy Birthday” written in Russian) and was devoured rapidly…more of it by me than anyone else. I can’t help it, I just LOVE spice cake. 2. Combine all dry ingredients in one bowl. 3. Combine all wet ingredients in a separate bowl. 4. Slowly mix wet into dry ingredients to create a smooth batter. 7. Pour in the bottom 1/4 of two buttered springform pans. 8. Bake for 45-55 minutes, testing near the end with a toothpick. 9. Release spring edges and allow to cool for more than 1 hour before frosting. 10. Cut the top of the non-apple lined cake so as to make it flat level. 1. Cream together butter, sugar and vanilla. 2. Add milk slowly, as necessary, to achieve desired consistency. 3. Cool in the fridge for 15-20 minutes, or as long as needed. 4. Place the leveled cake on the bottom of your cake plate. 5. Frost the top of this level cake. 7. Frost top and sides of entire cake generously. 8. Store in a lidded cake carrier or the fridge. I would call this a “Semi Vegetarian” cake because of the eggs. I delight in spice cake, it’s so tasty! I always prefer it over any other flavor. Thank you for sharing this recipe :).